Stuart Turner Delivers Quality In New Innovative Digital Pressurisation Units .. Trusted manufacturer of high quality pumps and water boosting systems Stuart Turner has launched its own range of digital pressurisation units. 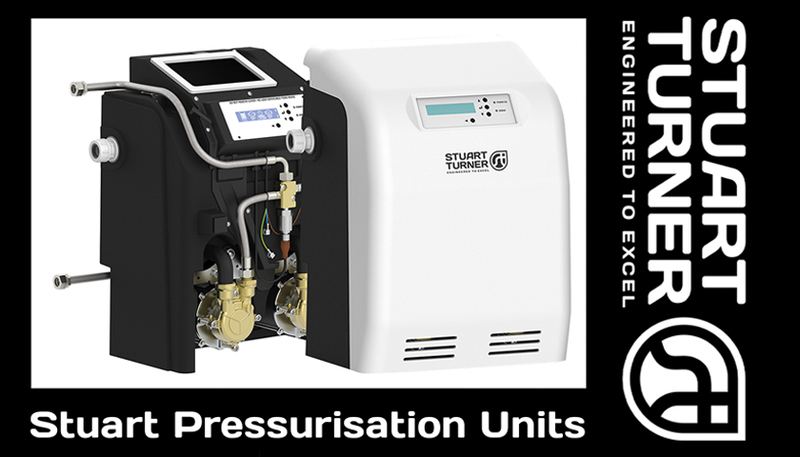 Adding to the brand’s growing portfolio, the Stuart Pressurisation Unit (SPU) range offers a unique monocoque design and advanced controls, representing the next generation of digital systems, at mechanical system prices. Designed and engineered by Stuart Turner, the SPU range offers automatic filling and pressure maintenance solutions for sealed heating and chiller systems, available in varying sizes to suit all application needs. Stuart SPU units are available with one (duty), or two (duty-standby) premium quality, continuously rated pumps featuring brass pump heads and impellers. The units are designed to be easy to install and commission, capable of filling a system from new before monitoring and maintaining the design fill pressure. The SPU range is comprised of three different models – the Mini, the Midi and the Maxi. The Mini – the smallest in the SPU range – is a cost-effective unit for systems with a capacity of up to 6,000 litres, fitted with a three-litre capacity reservoir is capable of pressurising systems up to 3.0 bar. Available for installations that require system pressure up to 5.0 bar, the units that form the Midi series have a reservoir capacity of 10 litres. The units can be either wall or floor mounted, and with an inlet and outlet configurable for either right or left hand side connection, offer superior flexibility during the installation process. The Mini and Midi units also benefit from a unique, robust plastic casing to remove the risk of corrosion that can often occur in metal alternatives. For those applications that demand higher system pressures, the Maxi Series is designed for simple floor mounted installation, has an 18 litre reservoir capacity, and can maintain systems requiring up to 8 bar. Producing little noise, both the Midi and the Maxi ranges are suitable for systems with a capacity of up to 300,000 litres, and also have four alarm outputs, one of which is configurable and a Modbus interface for connection to a Building Management System (BMS). BS EN 60335 and CE compliant, with built in safety in low voltage control, as well as multiple Volt-free contacts and BMS connectivity to external alarms and systems, the entire range offers quality and performance for both new and retrofit applications – with a two year guarantee on all units. Whilst many previous pressurisation units have relied on simplistic, LED scrolling display screens, the Midi and Maxi SPU ranges feature an advanced control panel with a full LCD display for simple initial set-up. These advanced digital controls, with a unique microprocessor provide self-diagnostics and an intuitive easy to use menu system. ‘We are incredibly excited to be releasing our own unique range of pressurisation units,’ said Peter Lambden, Design/Project Engineer at Stuart Turner. ‘The Stuart Turner name is synonymous with quality and reliability, and we are now looking to expand into the heating sector with a new innovative product range unlike anything currently on the market. We are very proud to have developed our SPU range with a multitude of original features, and look forward to its release in December’. To find out more about digital pressurisation units by Stuart Turner, please click here.